The following article by Mark Hilliard first appeared in the Irish Times on March 10, 2017. It is republished here with permission – Irish Times copyright clearance reference: 1094. Three years ago a small midlands community decided it had had enough. Properties were being broken into. The nearby Garda stations were all but closed. At night, when they knew they could get in and out unseen, the burglars had come. In a small area of countryside outside Durrow, Co Laois, 157 families came together to talk about what they might do to take on the raiders. “We had a lot of burglaries on farms, diesel being stolen, garages being broken into,” says Jim Murphy, a farmer and chairman of Dunmore Community Alert. “With the crime escalating we decided three years ago we would do something. Abbeyleix Garda station was closed down [at night] and Durrow is closed all the time. For a start the community installed the standard text alert system that allows residents to communicate about suspicious activity in the area. 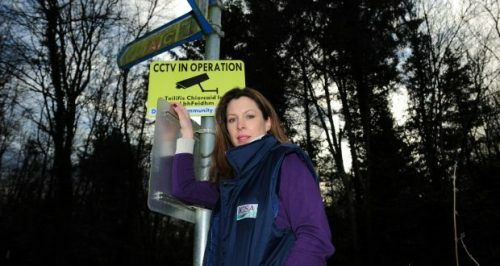 This was a start but real results came when they installed CCTV cameras throughout the area. The decision was made at an agm in 2015, and a fundraising drive began. There were golf classics, fancy dress events and table quizzes – eventually the community managed to raise €20,000. Later, with the assistance of a €50,000 grant courtesy of the Department of the Environment and former minister Alan Kelly, they had the money to install a modern camera system. In all 20 cameras were placed at seven locations on every road in and out of the area. They were even fitted with number plate recognition technology. Laura Starnes, operations manager of the Irish Cattle and Sheep Farmers’ Association who has lived in the area all her life, said more rural communities should be able to feel similarly secure. Last year there were no crimes in Dunmore by people travelling in from outside, locals say, with a couple of notable exceptions which are testament to the success of the cameras. “We had a local farmer down the road who had his quad stolen and he got it back thanks to the cameras,” Mr Murphy says. The number plate was identified “and we were able to trace where the quad went with the help of the guards”. Six months later the same quad was stolen by different thieves, and again the cameras snapped the registration plate, identifying a stolen vehicle and eventually helping gardaí track the occupants down and make an arrest. Today the residents of Dunmore sleep more easily in the knowledge that the cameras are watching. And the message is getting out. The nearby area of Shanahoe has followed suit, and other parts of the county similarly lamenting the closure of rural Garda stations have been making contact to learn from the Dunmore experience.